CamFlow stands for Cambridge information Flow architecture, the Cam is also the river that flows through Cambridge, UK. CamFlow is a Linux Security Module (LSM) designed to capture data provenance for the purpose of system audit. The whole-system provenance capture mechanism is highly configurable, and can fit the needs of many different type of applications. CamFlow can stack with existing security modules such as SELinux. To get in touch about the project, please contact Thomas Pasquier. CamFlow development started in 2014 at the University of Cambridge’s Opera Research Group (grant EPSRC EP/K011510/1). Further development has been supported by Harvard University’s Center for Research on Computation and Society as part of the Provenance@Harvard project (NSF grant SSI-1450277) and the University of Cambridge’s Digital Technology Group. Development is currently being supported by the University of Bristol Cyber Security Group and the University of British Columbia. The easiest way to contribute to CamFlow is by submitting issues to suggest improvements or report bugs. When reporting a bug, please specify the version of CamFlow you are running and your Linux distribution. To contribute a new feature, please fork the repository of the component you wish to improve, and submit a pull request against the dev branch. The pull request must pass the continuous integration test before it can be merged. There are three main options covered below for how to install CamFlow: 1. using your favourite package manager on Fedora or Ubuntu; 2. building the kernel on the local machine; or 3. using vagrant to set up a virtual machine. The quickest way to install CamFlow is through the packages hosted on packagecloud. For now, only Fedora and Ubuntu are supported (please, click on this link and check which release(s) is/are currently supported). The rest of this section describes how to install CamFlow and its dependencies on Fedora and Ubuntu. Check online to find the latest version number and update the above script accordingly. After reboot we should be ready to use CamFlow. We are a small research team. Packages are tested in virtual environment running over a limited set of hardware configurations. In most cases things work fine. However, if you encounter any issue, please do look at how to build the project from source. First we need to install the dependencies required to build our kernel. Depending on how recent your OS version is, you should install libelf-dev, libelf-devel, or elfutils-libelf-devel. See this issue for details. This will build and install the CamFlow Linux Security Module as well as the userspace tools. The whole installation procedure may take a significant amount of time. The installation process may ask for the root password, so may not complete in an unattended manner. The kernel configuration derives from the configuration currently present on the system where you run the build. Early in the build process you will be presented with a GUI to customise the kernel configuration. If you are not sure what to do, do not modify the configuration. Configuration options need to be carefully considered in resource-constrained environment. For the installation process to take effect you need to reboot the machine. Only the most recent release is actively supported. Using a vagrant virtual machine is much simpler. First you need to install vagrant and virtualbox. Some Linux distributions ship very outdated version of VirtualBox or Vagrant. Outdated versions, and host/guest version mismatch are known to cause all sorts of troubles during provisioning. Please check Vagrant and VirtualBox for details on how to install the latest version. Running virtual machines is resource consuming. Please, make sure the host has sufficient resource to do so (disk space, RAM, CPU etc.). When booting a VM after successful provisioning, ensure that the CamFlow kernel is chosen in the GRUB menu. CamFlow represents the execution of a system as a directed acyclic graph. Vertices in the graph represent states of kernel objects (e.g. threads, files, sockets etc…) and relations represent flow of information between those states. In the above example process 1 clone process 2. process 2 write to a pipe. process 1 read from the same pipe. Version are created to guarantees acyclicity and to represent proper odering of information (see our CCS’18 paper for details). Further description of the provenance are discussed in the output section. Configuration details are discussed in the recording configuration section. Configuration details are discussed in the capture configuration section. In this walk-through we explore how to capture and look at the provenance generated by wget. The tutorial assumes that CamFlow has been installed and is running on a Fedora machine, and that the reader has some familiarity with our paper describing linux provenance capture (ACM SoCC’17). X.X.X corresponds to the kernel version, and Y.Y.Y to CamFlow version. print out current configuration (can copy content in /etc/camflow.ini). display provenance info of a file. applies label to the file. mark/unmark the file as opaque. display provenance info of a process. applies label to the process. mark/unmark the process as opaque. track/propagate based on security context. create a new relay channel (in /sys/kernel/debug/<string>). The policy hash is based on the CamFlow version and the currently loaded capture policy. It can be used to quickly verify that two machines are running the same capture policy. It can also be obtained with camflow -p.
The system is clearly configured to publish the provenance to a log file, and this file has been specified to be /tmp/audit.log. If we were to publish our provenance to MQTT, we could visualise it in real time on our demo website. Note that changes to camflowd configuration require the system or the service to be restarted. One of the strengths of CamFlow is the ability to fine-tune the provenance information it captures. Edit /etc/camflow.ini to modify the capture configuration. To apply a new configuration, reboot the machine. Alternatively when developing policy you can experiment using camflow CLI (see camflow -h). Policies defined through the CLI are not persisted in current release. Following is a list of the parameters and their effects, broken down by section. A “boolean” parameter accepts values “true” or “false”. all boolean; capture provenance of all kernel objects? You can specify the node_filter parameter multiple times, with a different node type each time. See here for the list of supported node types. You can specify the relation_filter parameter multiple times, with a different relation type each time. See here for the list of supported relation types. As with node_filter, you can specify this parameter multiple times for various node types. As with relation_filter, you can specify this parameter multiple times for various relation types. No provenance records are emitted for nodes (relations) indicated by X_filter=Y. For nodes (relations) indicated by propagate_X_filter=Y, records will be emitted but tracking will not be propagated through them. “Compressing” provenance means emitting as few provenance records as possible to capture an interaction. 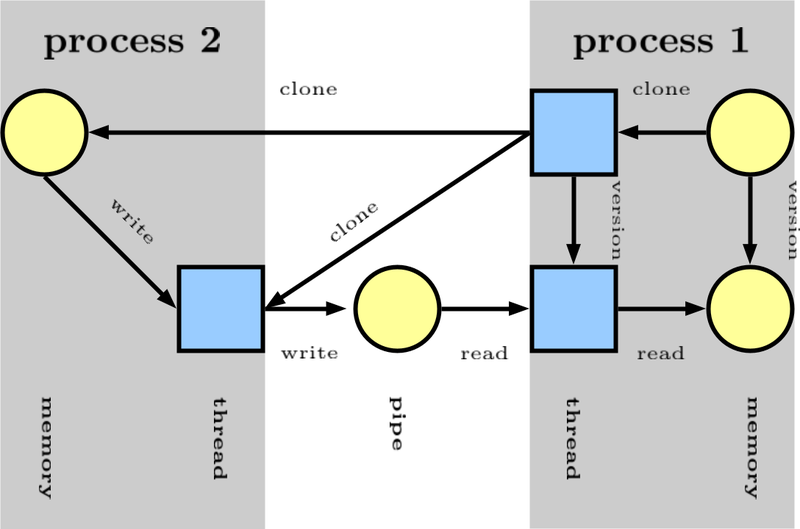 For example, if a process reads a file three times, then a compressed provenance record would contain only one read relation while a complete provenance record would contain three relations. This is desirable if the goal of provenance collection is to build a provenance graph. However, if you are trying to perform a security audit, then the fact and timing of multiple accesses may be of interest. In this example compression may be undesirable. This describes provenance capture behavior for files. Use track if you want the provenance information to include every time this file is read or written. Use propagate if you want the provenance information to track the flow of data out of this file, through other processes, into other files, etc. Track information leaving the system being monitored (connect). Specify an IPv4 address using the format <ip>/<mask>:<port>. Track information entering the system being monitored (bind). Like file, but for users. Like file, but for groups. Same as file, but for security contexts. Specify a security context using the format of the main Linux Security Module of the system (see here for SELinux). Further information about these parameters may be gleaned by perusing the header files in the kernel module. After CamFlow captures provenance, you can configure where and in what format the provenance information is published. The configuration file is /etc/camflowd.ini. To apply a new configuration, run systemctl restart camflowd.service. Here is a sample /etc/camflowd.ini configuration. Following is a list of the parameters and their effects, broken down by section. output where to publish provenance records? format in what format to publish provenance records? If output=log, these parameters take effect. If output=mqtt, these parameters take effect. If output=unix_socket, these parameters take effect. If output=fifo, these parameters take effect. The output generated by camflowd is formatted according to the W3C PROV-JSON format. The output is not a single JSON object, but rather a collection of objects each representing an arbitrary sub-part of the graph. Vertex and edge attributes within the prov: namespace are described in the W3C PROV-JSON documentation. The permissible values for the prov:type are described for relations and for vertices. We describe in the next section the attributes within the cf: (CamFlow) namespace. We are exploring means to formally model the provenance generated by CamFlow capture system. This is achieved by performing static analysis of the kernel source code. We have made available the models corresponding to LSM hooks and system calls. The models are also available in raw dot format. An early description of the process is described in our CCS’18 paper. The concept behind CamQuery is described in our CCS’18 paper. This section is under construction as we work further on this aspect of the project. If you encounter any difficulty, please contact Thomas Pasquier! You may need to install dependencies such as elfutils-libelf-devel. By default CamFlow does not generate provenance. We are going to change its configuration (more info here). You should see a list of edges and vertices. CamFlow is discussed in the following publications. Details given in these papers may be outdated – please refer to the code if in doubt or contact us.